Beginning to get marina fever and need a change of scenery. We backtracked to Punta de Mita 20.45.9 x 105.31W. 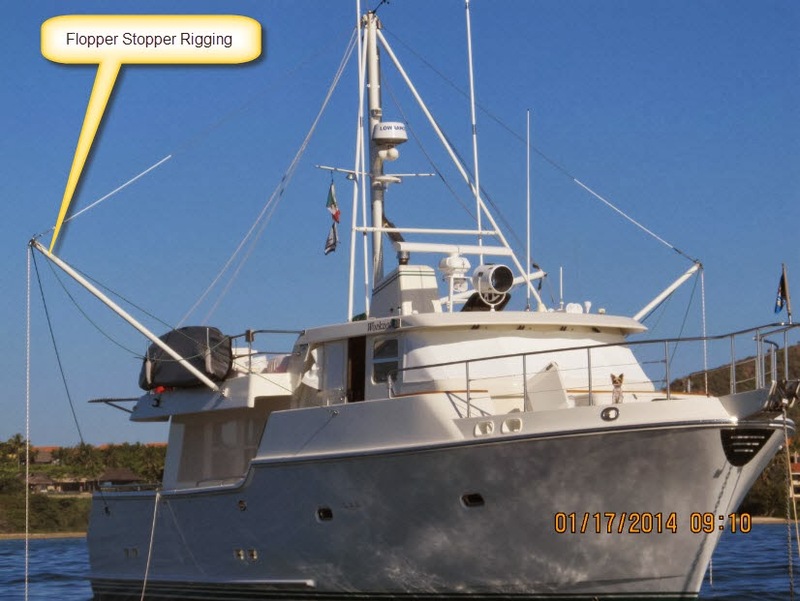 This fairly well protected anchorage is the first on the North end of Banderas Bay. Four Seasons has resort on the point featuring an 18 hole golf course and St Regis also has a very upscale resort on the same point. Surfing is popular on the point and within sight of the anchorage. We anchored in 27 feet of water over a sand bottom. Could almost see the anchor early in the mornings when calm conditions prevailed. Felt great to get back on the hook but the afternoon swell wrapped around the point and made for a rolly anchorage well into the night. Deployed our “flopper stopper” on one side and then both to improve the conditions. They helped but when the boat rolled aggressively something in the top of my mast was moving just enough to make me nervous. Flopper stoppers are hinged plates that hang off of fixed poles on the side of the boat. 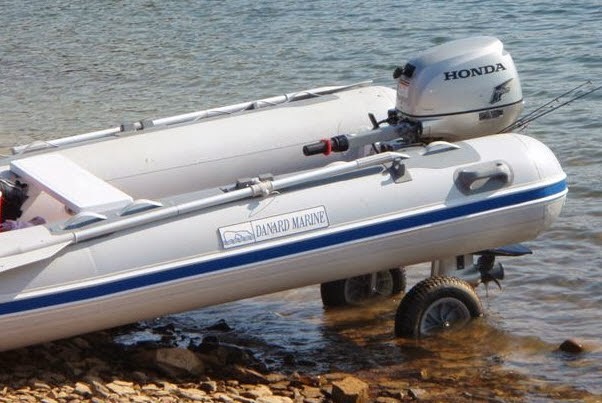 When the boat rolls to the side with the flopper stopper the plate hinge folds from the water pressure and when the boat rolls back the plate opens to present the entire plate surface area to horizontal to the water. A lot of forces is required to pull the plate upward and this reduces the roll on the boat. Same for the opposite side. The roll reduction is only available when anchored with our arrangement. These a connected to the end of the line going into the water. One on each side. 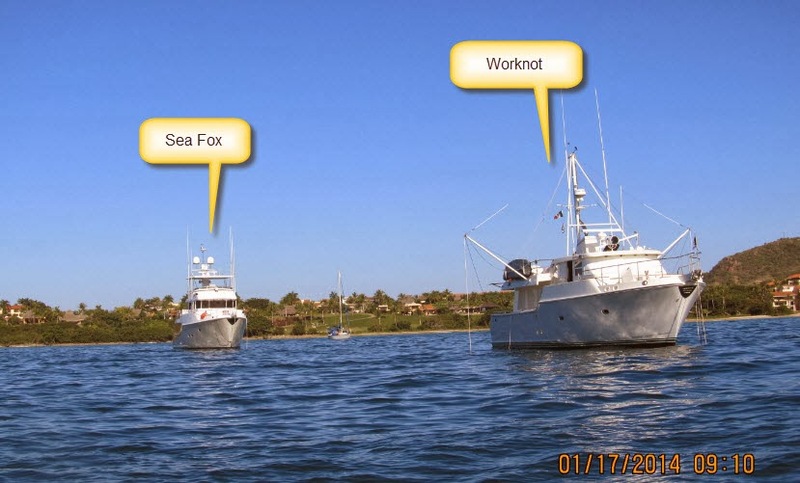 Sea Fox joined us for a few nights and we go some good pics of both boats on the hook. Landing a dinghy on the beach at Punta de Mita gave us some time to practice our skills with our smaller dinghy. 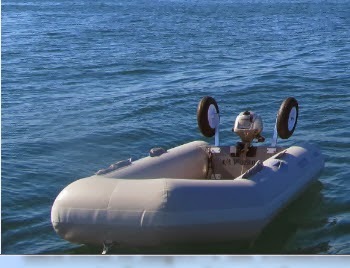 The plan was to use it for shore landings since it is light and only has a 2 HP engine. Many people us “dinghy wheels” to give them some help in pulling the dinghy onshore. We do not have them thinking we can just pickup the dinghy on shore. This odd looking combination is common in Mexico and not many other places. On my first attempt getting ashore was OK but on exit discovered the 2 HP motor did not have the power to turn or run straight with me sitting on the side of the dinghy. So, after timing the waves just right, pushing out and jumping on the side, starting the motor I turned in a circle and ran straight up on the shore again. Only a few people watching as I got soaked, filled the boat with water but did not turn it over. Next attempt I got fully into the boat and managed a somewhat graceful exit. We ate at several of the beach Palapas and the food was good and plentiful. One slight negative was the constant attempts of the local peddlers to sell most anything to the diners. From beautiful blouses and skirts to a bottle opener cleverly made to look like a seahorse. We caved on one item and got this. The guy’s approach was very original and he was persistent but not pushy. I have a great deal of respect for a salesman who can master this skill.